Medieval Castle Blog: A Castle Wedding With An Owl But No Pussycat! Medieval castles are often used as wedding venues for couples to get married in - they offer history and romance like no other venue can. It's a subject we've covered before with features on the likes of Eastnor Castle, one of the most romantic wedding venues in England. Although not medieval by age, its architecture is 'mock medieval' having been designed by the great architect Robert Smirke. Well, how's this for a touch of real castle romance ... a video of a couple who got married at Eastnor Castle on New Year's Eve 2009. 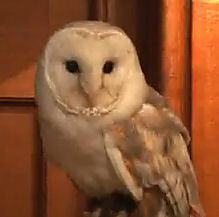 Watch out for the trained owl who flies down the church aisle to give them their wedding rings. How romantic is that?! Read about their romantic wedding and enjoy the video.